NORMAL is defined as: usual, average, the standard or common type. For some people normal is hitting the snooze button six times before actually getting out of bed. For others it’s coming home, immediately cracking open a beer and sitting in front of the TV. In my mind, ‘normal’ is what we experience often or on a regular basis. 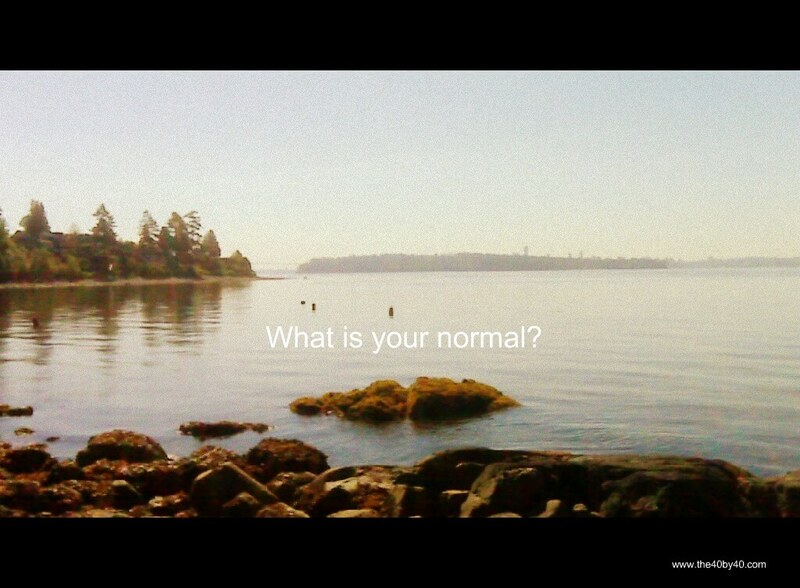 So what is YOUR NORMAL? My normal consists of walking my dog along the ocean or having meaningful conversations with friends. JOGGING is a normal part of my week as is LAUGHING. This was not always my normal. I had to change my normal because it wasn’t working for me…in fact, my past ‘normal’ was very damaging. In my childhood, poverty was normal. Not feeling safe or secure, always being afraid and fearing judgment was normal. Lies and manipulation was normal. Not understanding why I wasn’t a good person and why I deserved bad things to happen to me was NORMAL. In my twenties I partied almost every day trying to escape sadness, fear, deep insecurities and emotional pain. Being hung over was normal. Because I didn’t understand my past, I didn’t know how to correct my present. Normal was repeating what I knew. For part of my thirties normal was functioning with deep depression and anxiety, working three jobs, and feeling totally exhausted. Normal was staying in a highly dysfunctional relationship and isolating. I drank wine when I was lonely, sad, ashamed or frustrated. I continued to ignore my instinct and allowed another person’s voice to be louder and stronger than my own. Crying was normal. I’VE CHANGED MY NORMAL AND YOU CAN TOO! Now I demand healthy relationships, and I limit or sever ones that are toxic or aren’t balanced. I LISTEN TO MY INSTINCT. Closely. I HONOR my thoughts, emotions and spirit. I listen to what’s going on INSIDE so I can better manage what’s going on outside. I do this through the process of jogging. JOGGING HELPED ME CREATE A NEW NORMAL! Does it mean I don’t have bad days? No, they are a part of life and a part of learning but I have better coping skills and healthier patterns. Instead of escaping life, I am engaging in life…that is my new normal. Take a look at what YOUR NORMAL is and if it entails: yelling, silent treatments, excessive junk food, lack of exercise, anger, isolation, insults, control, lies, 3 or 4 glasses of wine or gossiping perhaps you need to make some changes to create a new normal. Remember: ‘Normal’ is what we do everyday; it’s the patterns, habits or level of acceptance we’ve allowed into our life. If your normal isn’t working for you, you can change it. IF YOUR NORMAL ISN’T WORKING FOR YOU, YOU CAN CHANGE IT! The first step is to recognize it. The next step is to decide to change it. The third step is to commit to yourself because you are worth it. Create a new normal, a better normal, a happier normal. It’s not without difficulty but it is with authenticity. You can do it. I believe in you. PS. Thank you for the amazing love and support you have given me by passing on my website and sending such wonderful emails. THANK YOU! https://www.businessmodulehub.com борис ложкин facebook борис ложкин Boris Lozhkin.